NFL Films and other football historians may gloss over it, but famous defensive units like Pittsburgh’s “Steel Curtain” and the “Fearsome Foursome” of the Rams had just as much interchangeable membership as your average pop music boy band or R&B girl group. Rosey Grier is arguably the second-most popular member of the “Fearsome Foursome” defensive line behind Deacon Jones, yet he was only part of the group for four seasons before Roger Brown replaced him. Ernie Holmes of “Steel Curtain” fame only played on on two of the Steelers’ four Super Bowl championships squads from that era. The Seattle Seahawks’ secondary has been widely considered the NFL’s best for the last half-decade, earning the catchy “Legion of Boom” nickname and helping the team to one Super Bowl victory and two NFC titles. The three staples of the unit have been free safety Earl Thomas (three-time All-Pro), strong safety Kam Chancellor (two-time All-Pro) and cornerback Richard Sherman (three-time All-Pro). The other cornerback spot — originally filled in Pro Bowl fashion by Brandon Browner — has recently been a revolving door occupied by Jeremy Lane, Walter Thurmond, Byron Maxwell and Tharold Simon. This past offseason, the Seahawks signed former Eagles and Ravens CB Cary Williams, who has been firmly entrenched as the starter through the team’s 5-5 start. Until now. Shead, who has also played safety and nickel back inside this season, entered [the San Francisco game] after Williams appeared to have the responsible coverage behind reserve outside linebacker Kevin Pierre-Louis down his sideline as tight end Garrett Celek caught a 33-yard pass. That set up a field goal for the 49ers in the third quarter. San Francisco’s first score came just before halftime, at Williams’ expense. On third and 7 with 63 seconds left in the second quarter and Seattle using defensive timeouts to try to get the ball back for another score, Williams played almost 10 yards off of wide receiver Quinton Patton. Patton made an easy turn and catch for the first down that sparked the 49ers into a 2-minute drill. That ended with Blaine Gabbert throwing down the middle seam to wide-open tight end Vance McDonald. Williams was well behind McDonald near the goal line. Free safety Earl Thomas whiffed on an attempted arm tackle at about the 2 on McDonald’s first career TD catch. The Seahawks signed Williams to a three-year, $18 million contract that guaranteed him $3.5 million this season but is not guaranteed after 2015. The free agent arrived from Philadelphia in March after former Seahawks’ starting cornerback Byron Maxwell got an average of $10.5 million over six years from the Eagles. This has been an up-and-down season for Williams and the Seahawks’ secondary. St. Louis, Cincinnati and Carolina, in particular, have burned Seattle’s zone coverages for big plays deep down the middle with tight ends. San Francisco became the sixth team to pass for a touchdown against Seattle this season. Every one of those six teams have had a tight end get a least one score. The Seahawks have allowed seven touchdowns to tight ends in those six games. Shead is exactly the kind of underdog the likes of which formed the foundation of the Seahawks’ recent success under head coach Pete Carroll. Like Russell Wilson and Doug Baldwin and Bobby Wagner, the 6-2, 220-pounder was among football’s overlooked and under-recruited at times during his career. 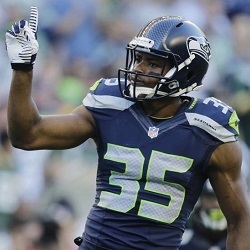 Last year Shead appeared in every Seahawks game but only started once, finishing the season with 14 tackles. In an expanded but still backup role this season, Shead has 33 tackles and one forced fumble. If he’s in the staring lineup this Sunday, he’ll be facing a daunting challenge in Pittsburgh’s star quarterback Ben Roethlisberger and pass-catching corps featuring Antonio Brown, Martavis Bryant, Markus Wheaton and tight end Heath Miller.